How I would love to have a JC! thanks for following sweetie. follow back now! Beautiful pictures! :D Seems like you had a great week! Looks lovely! And those shows are gorgeous! Great post! And lovely photos! E que blog lindo o seu , Já estou seguindo de volta, seja bem vinda ao meu blog , espero te ver muito por lá ! Thanks for visiting Rue de Tres Chic, I am following you back now. Wow, love your photos! I follow you back! Oh, you like Tokio Hotel? How lovely, me too! Lovely pictures. Looks like you had a lovely week! loving your blog! I'm following you now would love a follow back!! Hi Jelena! these photos are so cool, especially the one with the dog! :) Kisses! I liked your blog, it's nice! Great post, love those boots!! Thanks for the comment on my blog :) I'm following you back, I love yours! I'm following you now tooAlso your dog is co cute. I'm also addicted to instagram. lovely photos! xO! OMG - LOVE instagram! I am addicted TOO! Love your pup, and the shoes are TDF! I love these pictures, I think you might convince me to start using instagram now too! Awesome Jeffrey Campbells! I am so jellyfish lol! :] And you dog and parrot are adorable! Your drawing is so cool! I would like to thank you for leaving such a sweet comment and following my blog! I love your blog and I am definitely following you! You are so talented. Hope you share your new drawing once it's complete. u r doing a great job with that drawing ! Obozavam pudlice.Ova tvoja je tako slatka!! Thank you for following my blog. :) Following you now. Oh wow, are you tokio hotel fan? I'm too <3 Since.. I remember. About 10 years I guess, hah no. it's maybe too much but I remember them even if they have not any website <3 Good times :3 very good pictures. Super fotke! Kuca ti je preslatka, a crtaš predivno! Awww, Margalo is adorable :) Lovely pictures! Instagram is definitely a great way to get a peek into people's lives through the daily snapshots they take and share. I like your blog. I hope we could follow each other? instagram is so addicting! love the shoes! thanks for the comment love on my blog and being a new follower! definitely following you back and finding you on insta! That puppy is beyond cute, great photo diary! hello, Jelena :) thank you very much for the cool comment! your doggie is such a cutiepie! what is his name? :) oh and your JC booties are so fierce! such a fabulous pair of shoes! btw, I followed you back and I hope to hear more from you soon! you have an awesome blog! Hi gorgeous! I really liked your blog and I´m following you. I hope that you could understand all the post with the translator. Great pics! I love the boots! i love these photos, awk your little bird so much love! I love posts like this;) Great pics ! those JC shoes are gorgeous! I follow you back, because your blog is very sweet and inspirative! I love it! that drawing you are working on is so pretty! Thanks for the kindness with our blog. I loved her, we're following here! I love your instagram photos, very beautiful! And thanks so much for your sweet comment on my blog! 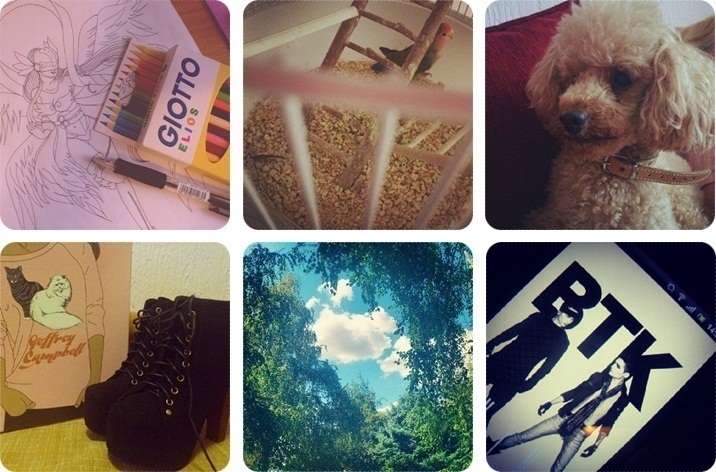 Nice photos :) I love instagram! Thanks for comment my blog, im now following u back! I always love looking at Instagram photos! These are cute! I am so behind and probably the only person not on Instagram yet. Nice way to get to know you... I have resisted the Instagram addition because I know I will never get off the computer! Chic photos! Thank you very much, beautiful! Cool photos! I love Instagram! Woow, this Angewomon is perfect, you're an artist! Wow! You have talent. That's a lovely drawing. & Aww, your pets are so cute! Aww, your dog is so cute! Oh you have really great blog. Good job ! Thank you for visiting my blog! Means the world to me, following you now on GFC! Let’s stay connected! Have an amazing week! Im following you too darling! I love the mustache pointer! Great pictures, I absolutely love the shoes! Your doggie looks so cute. You have the most adorable dog! Thanks for the follow - I'm following you now as well! Beautiful pictures, I love the Jeffrey Campbells, they come in such a cool box!! Following you back :) Have a great day! Thanks for stopping by doll, Your new illustration looks really great! Awesome pair of boots! That fifth photo is just gorgeous. Would love to see more from you! I love these instagram pictures ! Amazing drawing and cool boots!